Three quarters of building owners and contractors have experienced a dispute or claim in the last three years, and nine out of 10 say increased collaboration can be used to mitigate future risk, according to Managing Risk in the Construction Industry, a new SmartMarket Report from Dodge Data & Analytics. Produced in partnership with Alliant, and with support from e-Builder and Procore, the report is available for free download here. The report provides a unique link between specific risk reduction practices—like conducting regular meetings with the full project team, formal brainstorming and developing a plan to manage risk—and tangible project benefits, such as reduced construction cost, improved project schedule and improved safety. A key finding of the report is that collaboration is widely recognized as beneficial in an industry still plagued by silos and competition within teams. Among the three types of industry players surveyed – building owners, general contractors (GCs) and trade contractors – it is general contractors that have experienced the highest level of claims or disputes in the last five years. For GCs, subcontractor defaults, terminations and failures are the most frequent and costly issues they face. The report shows that 33 percent of GCs consider labor procurement and subcontract management to be high risk areas, and that 81 percent of all respondents find that labor scarcity will increase project risk. Building owners, by contrast, are most impacted by claims arising from construction defects, and trade contractors are plagued by the frequency of warranty issues. To help deal with these risks, industry can employ a series of risk evaluation and mitigation strategies. Formal brainstorming is by far the top evaluation strategy, but different players see different advantages, the report shows. Building owners are most enthusiastic about brainstorming, helping increase reliability of overall project performance, while GCs also see its impact on improved project schedule and safety. Trade contractors find it most effective for reducing construction costs. The most effective risk evaluation strategies, according to the study, are regular meetings with the full project team focused on risk and the development of a plan to manage risk, Both practices help increase project performance reliability, maintain project quality and improve project safety. 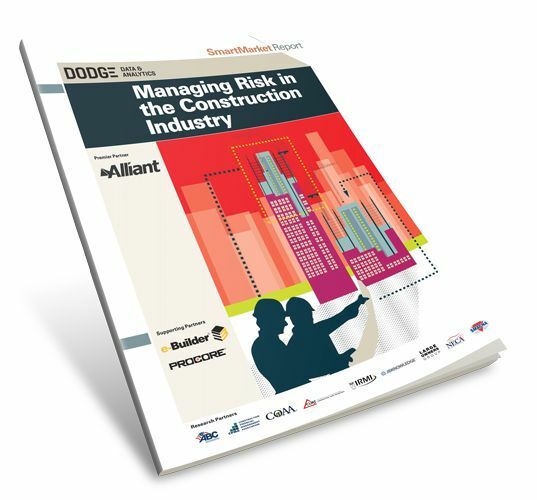 The Managing Risk in the Construction Industry SmartMarket Report also includes perspectives on risk from surety experts, offers tips on achieving cyber resilience, managing subcontractor default risk and dealing with active shooter risks on a jobsite, as well offering insights on risk and the evolution of the construction industry since the Great Recession. In addition to premier partner Alliant, supporting partners include e-Builder and Procore. A wide range of research partners also participated in the survey by distributing it to their members. They include: the Associated Builders and Contractors, the Construction Financial Management Association, the Construction Owners Association of America, the Construction Users Roundtable, the International Risk Management Institute, Inc., JB Knowledge, the National Electrical Contractors Association and the Sheet Metal and Air Conditioning Contractors’ National Association.